Though the automatic screen printing machine can give you a quick output, the manual screen printing machine also can work as good optional equipment to increase your profit. For production, an automatic screen printing Machine is exciting for any screen printing company. It reduces production time. The mechanical press can complete a day’s work within hours only. However, you shouldn’t leave the manual screen printing press very earlier as it can be used in different situation. A printing company can use a manual press as a vital tool for the automatic press gives you faster production. The manual screen printing machine is more adaptable than the automatic screen printing equipment. Using specialty inks for screen printing is the main advantage of the manual screen printing press and in you can easily make a variation in design with your brain. You can apply your special techniques to create extraordinary designs in your final print. The glitter and foil inks are among special effect inks. They work nicely to create high-quality screen printing on manual press. You have to deposit special effect inks properly while the print strokes according to the properties of the ink. You can quickly adjust the print stroke of the manual screen printing machine than the automatic press, and you can ensure a good ink deposit. A manual press can serve you a lot in the different situation while artwork from the automatic press is tempting to all. Most of all, speed is the major benefit to run a large press. Sometimes you have to keep reserve your automatic press for large scale of orders. In that situation, you can rely on the manual screen printing equipment for smaller orders. Similarly, you have the option to make the quick sample with the manual press for your client. You have the chance of reproducing the trial print to apply any technique you required while the automatic screen printing press fails to do. As the manual press is used for slower production time, you can take different initiatives to increase the speed of your manual press. 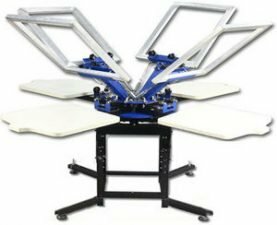 If your manual screen printing press can run “all heads down,” you can appoint multiple printers to put down multiple colors on any of the print head. The right tools and proper setup. Make sure your press is properly turned on the screen and keep productions rolling as quickly as possible. Try to keep the off-contract in an ideal distance for the ink and substrate. Give proper tension to the screen as low tension requires more effort. Use the right squeegee and the blade should be sharp and free from nicks and notches. To get the most output and profit from your business, you have to learn how to use the manual screen printing machine quickly and efficiently and also know when to use it. When you are able to maintain a manual screen printing press to take over small orders, you are no more relying on the automatic press. Thus, the manual screen printing machine plays a vital role to boost your profit. How to Make Higher Production?